Welcome to Katara the ‘QuickBooks training company’. We offer QuickBooks Training suitable for both New and Experienced UK QuickBooks user looking to improve skills and knowledge in the desktop or online versions of QuickBooks. If you have been using QuickBooks for a while you will have a good knowledge of the basics. We can help you to increase your knowledge to a higher level building on the skills and processes you already have. 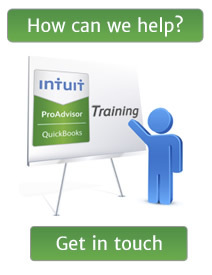 We offer QuickBooks training at your office focusing on the areas key to you and your business. Our QuickBooks training sessions for experienced users often include assistance in identifying and correcting problems built up in your file over a period of time. In addition to assisting in the tidying up of the QuickBooks data we can explain how the issues have arisen helping you to prevent problems reoccurring in the future. If you are an existing QuickBooks user find out more about the service we offer and the comments of people we have trained. For new QuickBooks users we can provide either a basic ‘Beginners’ course or a help you to set up and get started at your office. The majority of our new to QuickBooks customers choose the in-house onsite training focused on getting up and running with QuickBooks and adopting best practice. This allows us to share our experience of how businesses in the same or similar sectors have made use of the software. If your QuickBooks accounts file is set up correctly it will help you to understand and grow your business. A poorly created file can be more of a hindrance and cause difficulties in the future. Investing in creating a well structured file at this stage can save time and money in the future. If you wish to discuss the training options available contact us today. Let us know about your experience with QuickBooks and the areas of QuickBooks where you need help. We will find the best training solution for you and your organisation.